You'll admit that sometimes is really hard to find inspiration for writing blog posts. I always had a big pressure of writing amazing posts with a great value that are fun and interesting to read. That used to drive me crazy because that pressure was stopping me from creating amazing content. I learned how to completely ignore it and to stay focused to create content that I genuinely enjoy. That's when everything has changed! When I need inspiration for blog posts I immediately go to Pinterest. I love this platform soo much! You can find everything you want there from food recipes, remedies for your hair, skin, amazing editorials, tech and business guides and some really fun posts. When I lack inspiration for posts I always try finding some pictures that are going to inspire me. After I find them I start creating a story for it. Next step is making mood boards. When I need to create content for some project, I love making mood boards. I find photos that inspire me and I start making mood boards in Photoshop. I realized that this helps me create beautiful photos even without an idea how my setup is going to look like. Specifically, I think on flat lays or photography with products. These mood boards help me have the best styling in photography of product placement (if that have any sense to you). Not to talk about fashion editorials! I have a whole theory about mood boards and I'm planning on writing a whole blog post about it. I just think that they are a great tool for creatives! #3 Write about things that inspire you! This means that you should write about things that you want to read about. You should never write about something just for the sake of writing. It's most important that you love what you create and that inspires you, in that way, it's going to inspire others as well! Back in the days, I forced myself to write for others and I didn't like my content so much. So make sure that you are happy with your content. Push your limits and challenge yourself on a daily basis! #4 Find blogs that inspire you! Right now everyone is worried that no one read blogs anymore and that there's no point of them. Well, I don't think so, I think that they are our main platform and that the rest of social media like Facebook, Instagram and Twitter are just prolonging it. You never know what might happen to them. Do you remember the time when MySpace just tragically disappeared? Yeah, that's what I'm talking about. You'll always have your blog! It's a place where you can express yourself and engage with your community. After we cleared this, I can say that it's important to read blogs that are matching your interests and aesthetics. I love reading blogs that are visually beautiful and that have something to offer. 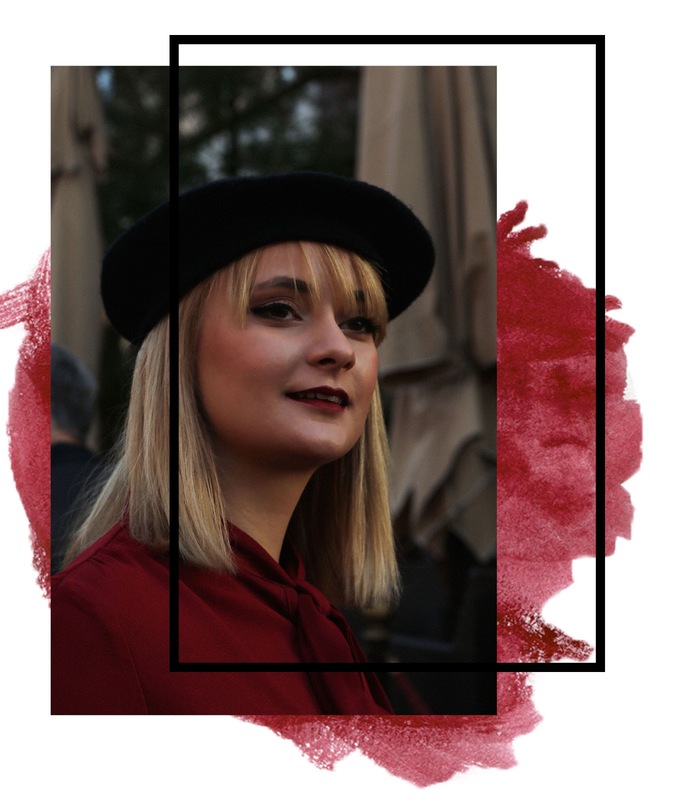 In this post I shared with you my favorite Style bloggers, soon I will update that list with lifestyle bloggers as well. I enjoy reading blogs and two of my favorite bloggers that I'm visiting on a daily basis are The Fashion Cuisine and Kate La Vie. This is it, I hope you found this post helpful and interesting. Let me know in the comments what are you tips for finding inspiration for writing blog posts? About this look, I wanted to create a feminine and classy look. This pleated skirt is a must-have if you are a lover of chic looks. I think every girl should have it! You already saw this skirt plenty of time on my blog, but I can't help it, I really love it! Paired with the beret, the whole look is screaming 'sophisticated Parisian', don't you think so? This blouse turns out to be a great combo with this skirt even though you wouldn't say they are a match when you look at them as a separate pieces. I added this big bag, that reminds me of a briefcase for mans. In my head, this look is wearing some super stylish fashion editor from fashion magazines like Vogue or Elle. I could totally imagine Miranda from Devils wears Prada to wear this look. For the end, I had to add these beautiful shoes! If you are following me on Instagram, you could see that I designed my own shoes at Shoes of Prey and that they have my name on it! I always wanted a pair of shoes like these and I'm so happy to have them now and with my name on it! I mean how crazy is that? You can use code BEAUTYSTUFFBYANA to have free inscription (valued at 45 GBP) of your desire if you decide to create your own shoes. I hope you enjoyed this look and feel free to tell me your thoughts on it! your shoes are so elegant, I love the square heel trend :) and your style in general is so posh, I love it! I absolutely love your outfit! So chic and elegant! and that bag, omg! Pinterest is everything! I always get ideas from there! It's not always easy to find inspiration when you're a blogger. It's definitely important that we think about the things that inspire us. These are lovely suggestions! Yes to all of these tips! Inspiration is literally everywhere! I love this look. That skirt is amazing! I love going on Pinterest whenever I need an idea for a blog post! It's very easy to find and filter inspiration there! Also, love your skirt! Draga Ana, pratim tvoj blog već neko vreme, zaista uživam u tvojim postovima jer odišu stilom, sjajna si! You look like a doll :) So well put together! I love the shoes and how bright the top is. First - Love the Skirt! Second - I love pinterest and similar blogs for inspiration. I find that I can get great ideas from them or expand more on the topics. Great tips, also, the best thing is do what inspire you because you get creative when you do it and its long-term blogging! I love this post and the look is classic I love the top and skirt, but I would wear a 1 inch heel. Some great tips. I also find that I need to write in the moment. Either I sit down and just type out some thoughts and come back later to edit, or I'll write my thoughts down in a notebook I carry in my bag. Thank you Alaina. Totally agree with you, I love writing things and making moodboards in my notebook as well, it's so easier to write after that! YOUR blog is such an inspiration. AND Pinterest. Always Pinterest. Love the different looks you create every time. I don't really have to find inspirations for blog posts as I have too many backlogs... Also, I write film reviews mainly, hence new films = new posts!